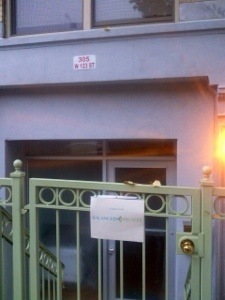 Pilates studio coming to Harlem? | HarlemGal Inc.
Pilates studio coming to Harlem? Looks like a Pilates studio is coming to Harlem! And it’s called Balanced Pilates! A long time reader of HarlemGal Inc sent in this photo yesterday saying the photo was taken in front of a building that’s being renovated on 123rd Street between Frederick Douglass Blvd. and St. Nicholas Avenue. As soon as we have more details about this new Harlem business, we will pass it along! Happy Monday! This entry was posted in business, Frederick Douglass Blvd., Harlem bloggers, Harlem blogs, Harlem businesses, HarlemGal, health and wellness, St. Nicholas Avenue, Things to do in Harlem and tagged balenced pilates, Harlem, Harlem businesses, HarlemGal Inc., health and wellness, pilates, Pilates studio. Bookmark the permalink. wow. Lower FDB is getting all kinds of great services! Lower Lenox has a bright pink Conway , A shuttered failed low brow restaurant called Foot’n it or some mess like that which is directly next to a shady barbershop and a run down laundromat… Native is busy renovating and they will probably finish and that scaffolding that has been sitting there for years on that building will probably still be there… Native should’ve bought the space next door and expanded but it’s too late..ANOTHER beauty salon has taken that space over… missed opportunity… The real estate office just further north of that has chosen to move to lower FDB and that space would be perfect for a great Thai restaurant, but sadly that opportunity will probably be missed.. Another missed opportunity is the space direclty next to the funeral home (YIKES) which is now occupied by ANOTHER barbershop that features a bright neon sign in it’s window… Further north of that is some new chi chi restaurant that I can’t see many people going to which is some style called Table Haute where you are forced to eat what the chef is cooking.. There are a few bright spots – Settipani, the florist which is next to Cafe Latte, Barawine., we also now have a great hardware store…. Whole Foods seems to be taking FOREVER to get started and lastly there is the overpriced , mediocre Harlem Shake…. Can anyone tell me why progress is happening so rapidly on lower FDB and why it’s so much slower on lower Lenox? Surely the projects sitting right below 116th have something to do with it, but there has got to be something else that has made progress so much slower in this section of the ‘hood.